The mutual fund industry has grown rapidly over the past 15 years and now manages $40 trillion in assets worldwide (ICI 2017). As a result, mutual funds have become major international financial intermediaries, acting as an important channel for cross-border portfolio capital flows (Didier et al. 2013). The growth of passively managed and exchange-traded funds (ETFs) has been a notable recent development in fund management (Cremers et al. 2016). The assets held by ETFs have increased even more rapidly than those of the industry as a whole. The share of fund assets held in ETFs has risen from 3.5% in 2005 to 14% in 2017 (Figure 1). Source: Data from EPFR Global. Note: Data plotted at the end of each year. 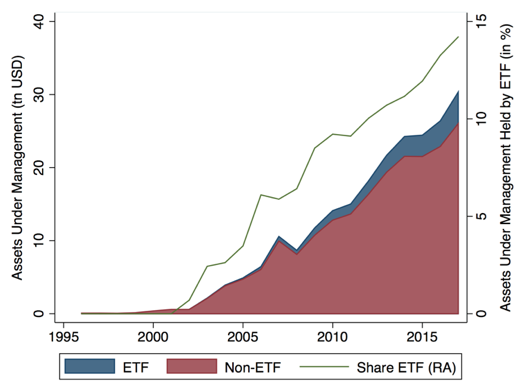 Share ETF (right axis) represents the assets under management held by ETF, divided by the total assets under management of all funds, expressed as a percentage. The rise of ETFs has been even more striking for funds investing in emerging market assets, with the ETF share reaching 20% in 2017. On the other hand, the exposure of aggregate portfolio equity capital inflows to global risk has steadily increased over the last 15 years (Figure 2). It is striking how this increased sensitivity has coincided with the increased share of emerging market financial assets. Source: Data from EPFR Global and FRED. Note: Portfolio equity liability flows to emerging markets expressed as a share of GDP. Rolling beta is the slope of a 36-month rolling regression of the portfolio equity liability flows, over GDP versus the difference in the St. Louis Financial Stress Index. 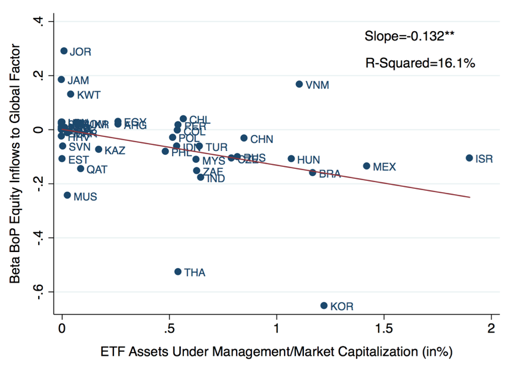 ETF Market Share (right axis) represents the assets under management held by equity ETF divided by the total assets under management of all emerging market funds, expressed as a percentage. In a new paper, we find evidence that these trends are related (Converse et al. 2018). Because (fund-level) investor flows to ETFs are more responsive to global risk shocks and less responsive to local country conditions. Therefore, if a larger share of a country's market capitalisation is held by ETFs, aggregate portfolio flows will be more sensitive to global factors. Thus, the growing importance of ETFs as a conduit for international capital flows helps explain the increasing co-movement of asset prices with global risk factors. This is a pattern that has been central to the literature on the global financial cycle (Rey 2015). Most research so far has estimated capital flows at the fund-country-time level. 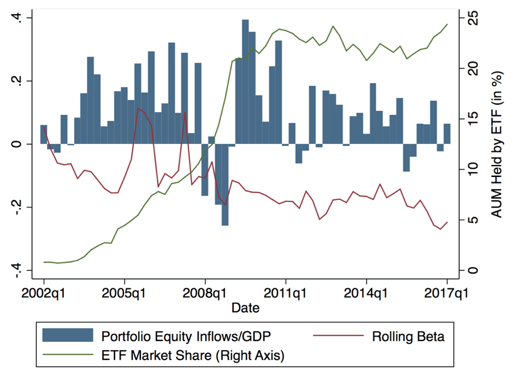 Our research uses reported investor flows, specifically the monthly fund-level data on equity and bond mutual funds and ETFs from the commercial data provider EPFR Global. These data cover the period from January 1997 to August 2017 for equities, and from January 2002 to August 2017 for bonds. In mid-2017, EPFR data accounted for approximately 66% of total worldwide assets of mutual funds and ETFs. We run fund-level flows against global push and local pull risk factors, and we interact those factors with an ETF dummy to identify different sensitivities. To simplify the procedures, in each regression we include only one pull factor (the St Louis Fed Financial Stress Index, a broad measure of global risk conditions) and one push factor (the median of growth in industrial production, IP, across countries included in each fund’s scope). The results are robust when we use different global and local risk factors. This pattern has been consistent (Figure 3). Except for a brief period of time, the 36-month rolling slope of a regression of aggregate fund flows on global risk (our measure of the sensitivity of ETF flows to push factors) has been larger in absolute terms and has increased steadily since 2012. Note: The beta flows/AUM to global factor is the slope of a 36-month rolling regression of the aggregate investor flows over initial assets, versus the difference in the St. Louis Financial Stress Index. Mutual fund flows respond to local conditions in the countries where these funds invest, whereas ETF investors do not. 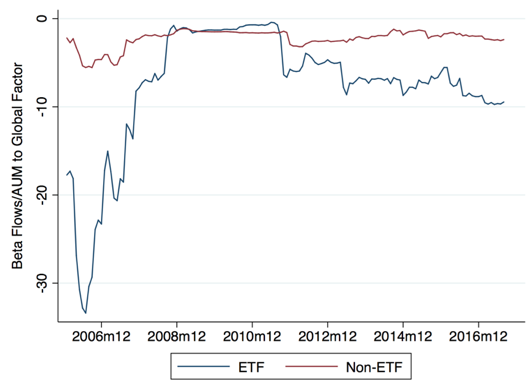 The sensitivity of ETF flows to global factors significantly exceeds that of flows to (a priori comparable) passive, low-fee mutual index funds, which differ from ETFs in that their shares are not continuously traded. Figure 4 suggests that the extra global sensitivity of ETF flows aggregates to create greater global sensitivity of country flows and asset prices. It shows the negative correlation between the β coefficients of country-by-country regressions of equity inflows and stock market returns on the global risk factor, against the average share of local equities held by ETFs for the same period (ETF Share). Note: This figure depicts the exposure to global factors and the relationship with the presence of ETFs in each emerging country. Vertical axes: coefficient of a regression of balance of payments portfolio equity inflows to the difference in the St Louis Financial Stress Index (top panel) and coefficient of a regression of MSCI stock market returns for each country to the difference in the St. Louis Financial Stress Index (bottom panel). In both cases, the horizontal axis is equity assets held by ETFs in each country divided by the total stock market capitalisation. Examining this link more rigorously, we find that, where ETF hold a larger share of a country’s equity market capitalisation, both portfolio inflows and aggregate stock market prices are more sensitive to global risk.2 A one standard-deviation increase in the share of equity held by ETFs is associated with an exposure to global risk 2.5 times higher for portfolio equity inflows. For stock market prices, a similar increase is associated with an exposure to global factors almost 1.4 times larger. We include the share of local equities held by traditional mutual funds so that it can proxy for more traditional financial integration. We find that only the ETF share is significant when interacted with the global risk factor. We use inclusion/exclusion from MSCI indexes as an alternative proxy for ETF Share, and the results were qualitatively similar. This is consistent with the hypothesis that ETFs amplify the incidence of global factors on local markets. Overall, these findings support the intuition that the growth of passive benchmarked instruments contributes to cross-market co-movement and capital flow synchronicity with global factors at the expense of local fundamentals. This is in line with the 'benchmark effect' introduced in Levy-Yeyati and Williams (2012). Raddatz et al. (2017) provided evidence for this effect by showing that changes in benchmarks have affected capital flows and asset prices. ETFs may attract investors who are particularly sensitive to global risk and inattentive to local conditions in emerging economies. Alternatively, they may induce a general representative investor to behave differently. Whether it is the perceived liquidity of ETFs or the unsophisticated nature of its investor base, ETF liquidity seems to be key to understanding the peculiarities of ETF flows, and their contribution to the global financial cycle. Converse, N, E Levy-Yeyati, and T Williams (2018), “How ETFs Amplify the Global Financial Cycle in Emerging Markets”, Institute for International Economic Policy working paper 2018-1. Cremers, M, M Ferreira, P Matos, and L Starks (2016), “Indexing and active fund management: International evidence,” Journal of Financial Economics 120(3): 539–560. Didier, T, R Rigobon, and S Schmukler (2013), “Unexploited Gains From International Diversification: Patterns Of Portfolio Holdings Around The World,” The Review of Economics and Statistics 95(5): 1562–1583. ICI (2107), Fact Book, Investment Company Institute. Levy-Yeyati, E and T Williams (2012), “Emerging economies in the 2000s: Real decoupling and financial recoupling,” Journal of International Money and Finance 31(8): 2102–2126. Raddatz, C, S Schmukler, and T Williams (2017), “International Asset Allocation and Capital Flows: The Benchmark Effect”, Journal of International Economics 108: 413-430. Rey, H (2015), “Dilemma not Trilemma: The Global Financial Cycle and Monetary Policy Independence,” CEPR Discussion Paper 10591. The use of investment-scope-time fixed effects was a key part of our identification strategy. It was possible that ETFs were created in asset classes that had a larger sensitivity to global risk. By using investment-scope-time fixed effects we absorbed the average investor flow varying at the time level. More specifically, we estimated a regression of gross equity liability flows from the balance of payments or the MSCI country returns on our global risk factor, and an interaction of the global risk factor with the lagged share of local equities held by ETFs.